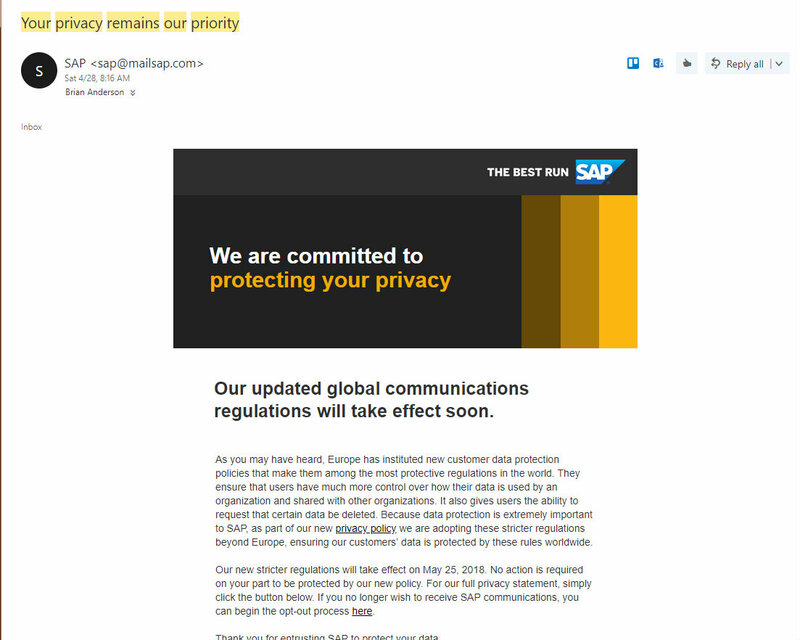 Research from Act-On Software shows that one-third (33%) of marketers said they do not understand what GDPR is exactly and have not begun to adjust operations and engagement strategies. The majority (55%) of B2B companies do not believe that the rest of their business understands the impact of GDPR. The study also showed that there is a 50/50 split between organizations that believe that GDPR will make their marketing better versus those who believe it will make their marketing more difficult. This one is a no-brainer. If you are not already taking a buyer-centric approach to your marketing and sales messaging, you and your team might have a bit more to work on when your re-opt-in campaign is behind you. When producing email copy, focus the conversation on what your customer/prospect values from the relationship between them and your brand — and what they will miss out on if they do not re-opt-in. This could include your content, sneak peeks into upcoming events or product announcements. With a May 25 deadline, it is important to put a bit of urgency into the messaging to note that this is a critical topic for your audience. However, going overboard with the urgency can lead to ignored emails — it is important to find a healthy balance of buyer-centric messaging and urgency. 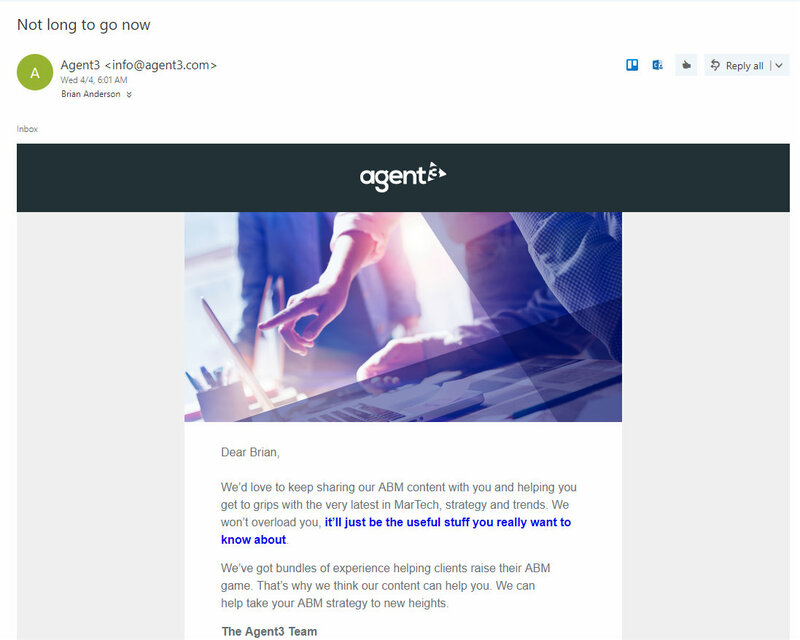 Agent3 decided to place some urgency in its email subject line. Once in the email, the messaging was clear, concise and compelling towards what the recipient gains from updating their preferences. As with all marketing messaging, it is possible to have a little fun with the content while remaining relevant and engaging to your audience. European data compliance can be fun if you use a little imagination. 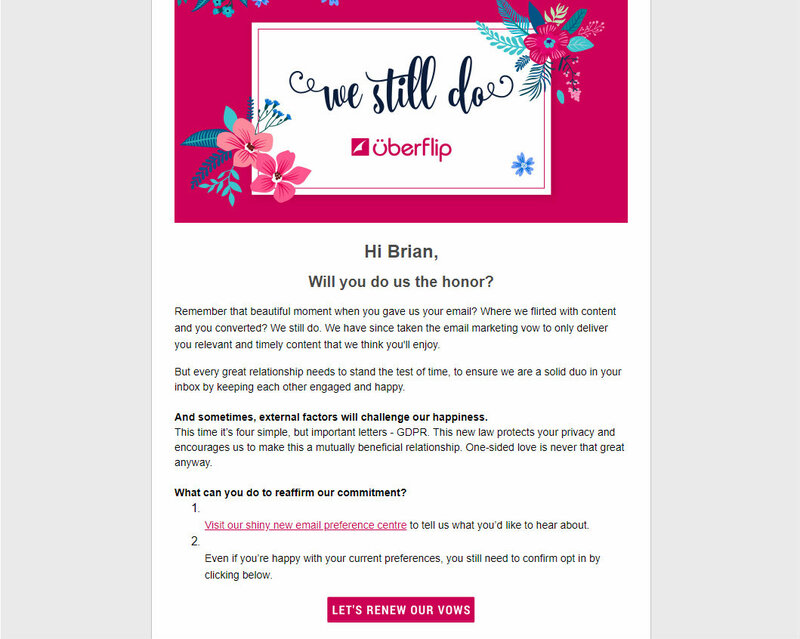 Uberflip themed their re-opt-in email around the concept of wedding vows. This was clever in and of itself because it a) highlights the importance of the subject matter, and b) ties it to a personal and relevant topic in today’s society. Have you received any interesting re-opt-in emails that caught your eye? Leave a note in the comment section below!